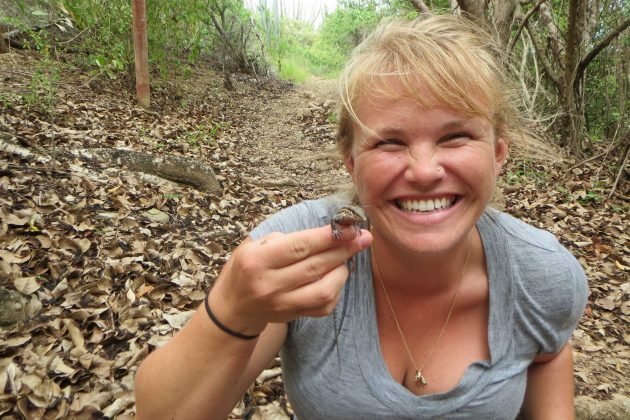 To catch lizards on the offshore islands close to St. Croix in the Caribbean, Smithsonian herpetologist Nicole Angeli uses a lasso of thread looped at the tip of a fishing pole. Slipped over an animal’s head and gently tightened, the waxed line allows quick capture, minimal stress and does not rip the thin skin of a lizard’s neck. For more than a century, mongooses on St. Croix have displayed no such empathy for the St. Croix ground lizard (“Pholidoscelis polops”), an island native with a neon-blue tail that is now extinct there. Small Asian mongooses released on St. Croix in 1884 to control rats infesting the island’s sugar plantations have voraciously chewed-up and eaten these secretive lizards to oblivion. Now biologists want to bring the St. Croix ground lizard, ranked as one of the rarest lizards in the world, back to its namesake island. 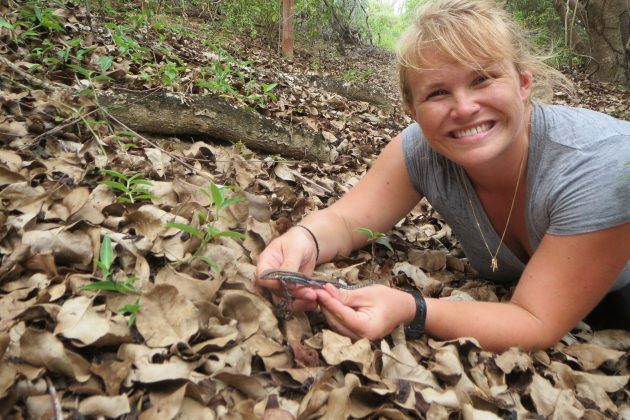 Here Angeli, who works in the Division of Reptiles and Amphibians at the Smithsonian’s National Museum of Natural History, discusses the St. Croix ground lizard and its future on St. Croix. Q: The St. Croix ground lizard is extinct on St. Croix. Where would you find animals to reintroduce? Angeli: Despite vanishing on St. Croix, small populations survived on two tiny off shore islands where mongooses do not live—Protestant Cay and Green Cay. 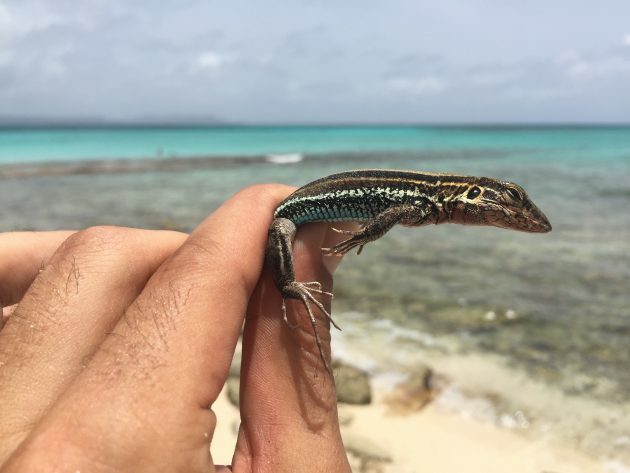 Thanks to the Virgin Islands territory and U.S. federal agencies, a third island (Ruth Cay) and a fourth island (Buck Island) were turned into lizard paradises after decades of habitat restoration and elimination of invasive mammal predators and plants. My research program spans their range, but much of my work focuses on a population introduced in 2008 to Buck Island, where their numbers have grown. In 1989, fewer than 300 St. Croix ground lizards lived on two cays. Today there are more than 2,000 lizards on four islands. Animals born on Buck Island are able to use multiple types of habitat historically available in the Caribbean, something they cannot do on the other cays. Their introduction on Buck Island has been a great success, and what we’ve learned has given us new insights into their resource needs and what we know for the first time are very general habitat requirements. Q: What do they look like and what do they eat? Angeli: Adults are about 4 to 5 inches long including their tail. They’re dark brown with horizontal brown stripes running down their back with a white stripe running along their black sides. They have white bellies. The breeding adult males get a deep neon blue coloring on their sides and a deep red throat patch on the side of their head. Their diet consists largely of ants and centipedes, millipedes and berries, but I’ve seen them catch a moth out of the air and drink water from bromeliads. As a natural defense, their tails detach, allowing them to escape some predators. They reproduce throughout the year, laying one egg at a time, over 4 to 5 years. We’ve inferred their life history information using museum specimens and the data our lab and other labs have collected on live individuals. Q: Why do you need to catch the lizards? Angeli: To weigh them, measure their length, take photos and take tissue for genetic studies. I use weight and length to monitor how healthy they are, analogous to what happens when you go to the doctor for a check-up. Sometimes, this mirrors what’s happening in the environment. 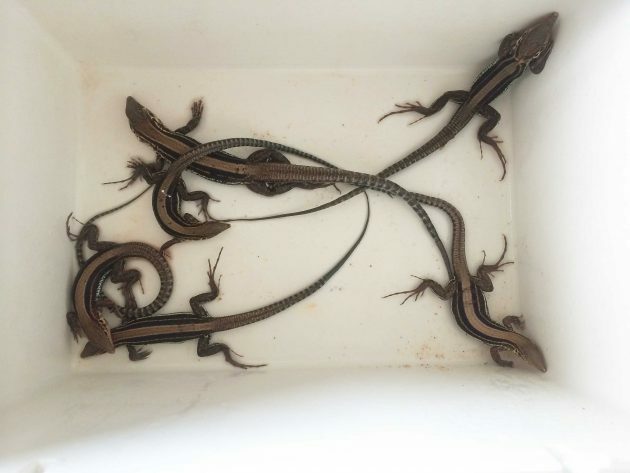 For example in 2015, we had a drought and all of the lizards we caught that year were relatively small. In another example, we went to Protestant Cay in 2013 to count how many lizards there were and I caught a number of lizards with forked tail tips. We think this condition is caused by rat bites and may be an indication that rat numbers were very high on Protestant Cay. Intensive rat trapping on that island reduced the number of bifurcated lizard tails. St. Croix Ground lizards are really hard to catch! I average one per hour, and I’ve been catching lizards for a decade. To estimate population size, I count all the lizards I see without catching or marking them. We use mathematical models to estimate population size. 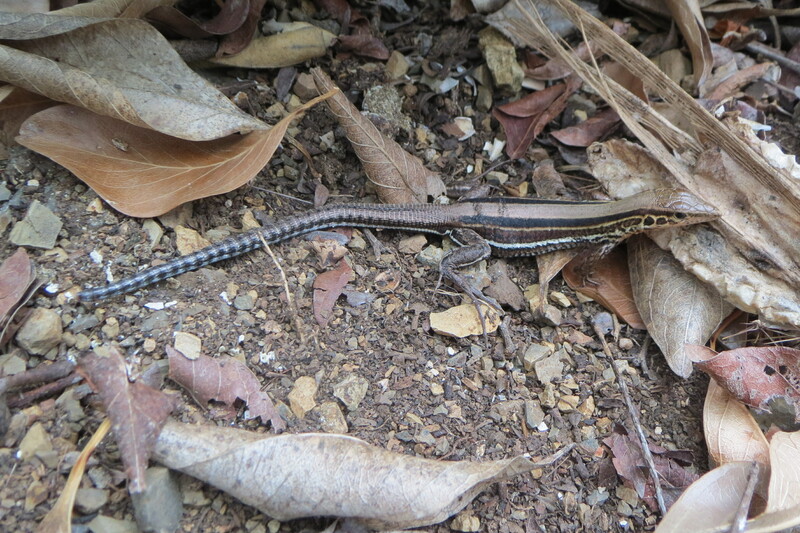 One surprising lesson from our monitoring is just how few of these lizards you actually see. Quiet, camouflaged and moving about under the leaf-litter of the forest floor, only a small fraction of an actual population is visible. For example, if I see 25 lizards during an outing, our research tells us this number represents a population of 160 or so in a given area. Q: What are the main barriers to their reintroduction on St. Croix? Angeli: Mongoose are great hunters. We’ve studied the distribution of mongooses on St. Croix to find sites where interactions between mongooses and the lizards would be low. Fences and natural landscape features might be used to exclude mongoose from those areas. There’s also a synergy between mongooses and climate change that works against the lizards. As it gets hotter these small reptiles have to move around more from sun to shade patches to thermoregulate their body temperature. As a result, a mongoose is more likely to spot them. We also suspect rats love ground lizard eggs. St. Croix ground lizards bury their eggs a quarter of an inch under the sand and rats smell them, dig them up and eat them. Cats are on Caribbean islands, too, and they’re very happy there because cats love lizards. I haven’t talked to a single person with an outdoor cat on St. Croix who hasn’t told me that they see their cat bringing back other species of lizards that still survive on the island. Q: What are the chances reintroduction will be a success? 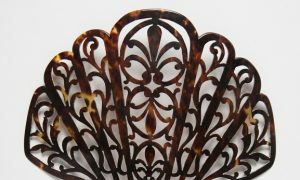 Angeli: I’m an optimistic person! They are thriving on Buck Island and their introduction gives every indication that they would do well back on St. Croix under the right circumstances. We need to explore how to create predator-free refuges for the St. Croix ground lizard. Countries like New Zealand are exploring how to create predator-free areas to bring endemics back, and Hawaii has implemented fences like the ones we are considering. Conservation-reliant species in the Caribbean like the St. Lucia whiptail lizard, birds, rock iguana, etc., could benefit if we find a way to reintroduce native animals now surviving precipitously on small cays. 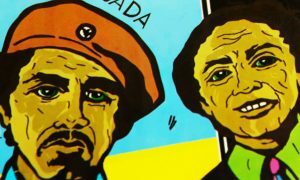 The Caribbean community of biologists can get together and decide how best to do this. We’ve already lost animals–three on St. Croix—that did not survive on offshore cays. With increasing hurricanes and weather in the Caribbean, these cays are not secure. Understanding what makes a species become endangered or enables it to persist is an important concept. The world has changed for island species accustomed to historic conditions. We need to change our conservation ideas and paradigms accordingly. Re-introduction of the St. Croix ground lizard hasn’t happened yet on St. Croix, but it is not futile and an attempt has great potential to inform wildlife conservation for other Caribbean species.